Small package: 3.0" x 3.2" x 1.1"
PI Control with "Smart Integrator"
The PTC-CH controllers operate from a single power supply between 4.5 V and 30 V. The linear bipolar controller drives a Peltier thermoelectric cooler or a resistive heater, and the chassis-mount package integrates easily into OEM applications. 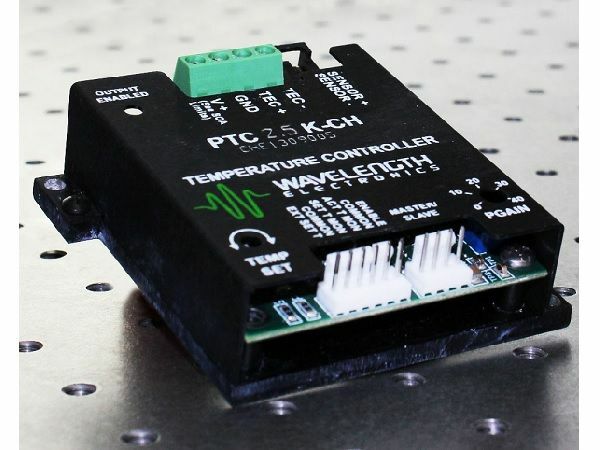 PTC-CH controllers interface with a variety of temperature sensors, and the bias current is adjustable in order to maximize controller sensitivity and stability for your application. The compact chassis-mount design simplifies heatsinking and requires minimal space. PTC-CH controllers are quick to configure for your prototype project, and there are no surprises when it’s time to integrate the controller into the final design. Remote computer control is available using the USB KIT, which also allows graphing and datalogging. If you are using a Quantum Cascade Laser or need low noise performance with a laser diode, we offer the PTC-CH nested in the QCL OEM drivers. If the optional remote temperature setpoint signal is lost, the controller defaults to a standard “safe” temperature setpoint (25ºC when a 10 kΩ thermistor is used). The safe temperature can be changed at the factory; call for details. An on-board trimpot is used to set the output current limit to prevent over-driving the TEC, and helps protect your load from thermal runaway situations. Proportional gain is easily adjusted with an on-board trimpot. Low temperature coefficient design remains stable across a wide range of ambient conditions.